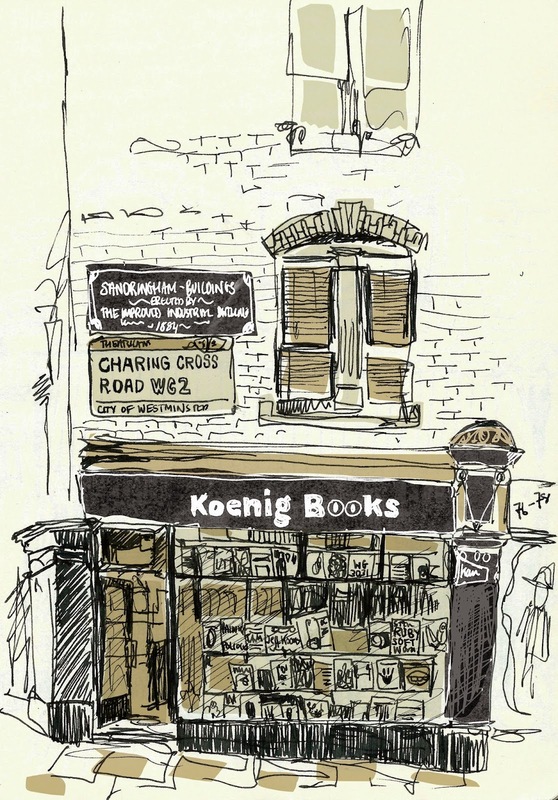 When I am in London I like to peruse the bookshops on Charing Cross Road which is renowned for its specialist antiquarian and secondhand bookshops. 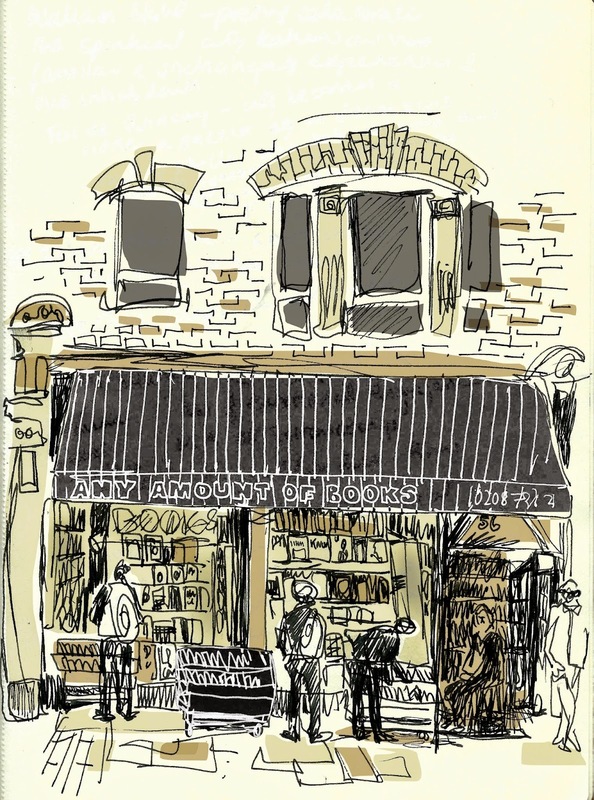 I love the low lit, dusty, damp, and mysterious isles of cramped books full of hidden stories and history beckoning to be looked at. The thought of finding something serendipitous amongst the shelves fill me with excitement. 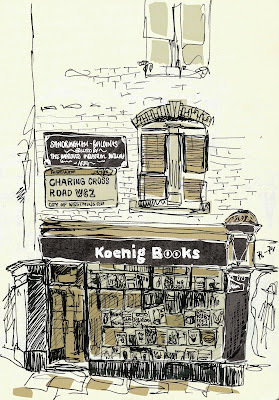 There is a best selling book named after the street called “84 Charing Cross Road”, a 1970 book by Helene Hanff , about a twenty year correspondence between Frank Doel chief Buyer of Marks & Co and her. 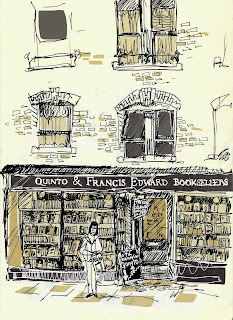 I thought I would spend time sketching some of the bookshops that are still surviving. 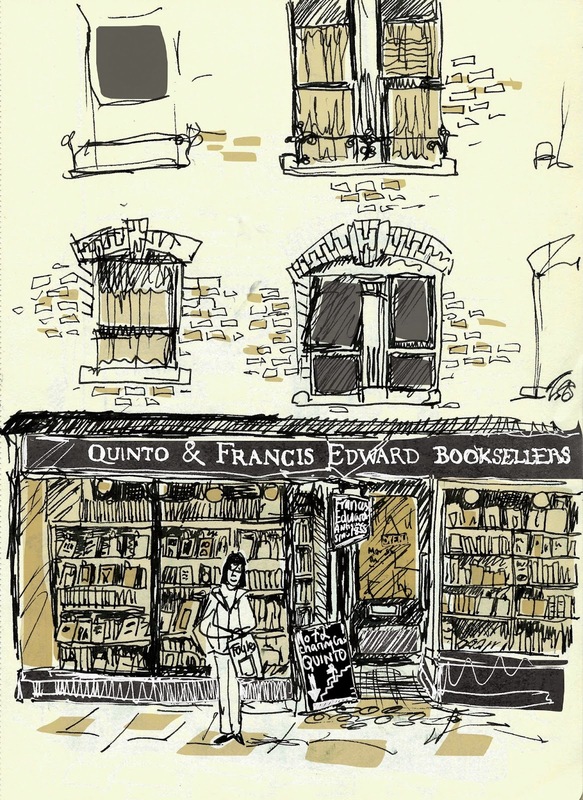 Bookshops especially second hand ones seem to be in decline and driven out of business by the Internet and Ebooks. 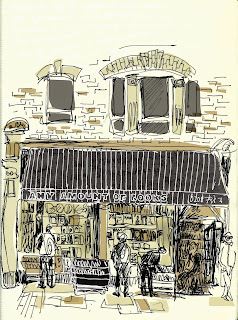 I am building quite a collection of shop front illustrations. I am inspired by the Typefaces and signage on buildings. I have used A Lamy Safari fountain pen to do the pen work on situ and then digitally coloured the sketches using Photoshop. 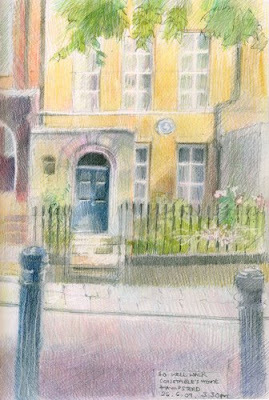 END: 3:30pm - back at the flat traffic island between Flask Walk and Well Walk, opposite Hampstead Museum - to have a look at more sketches and take any more photos, with the option of retiring to the nearby Flask pub, or a cup of tea at the Buttery café! 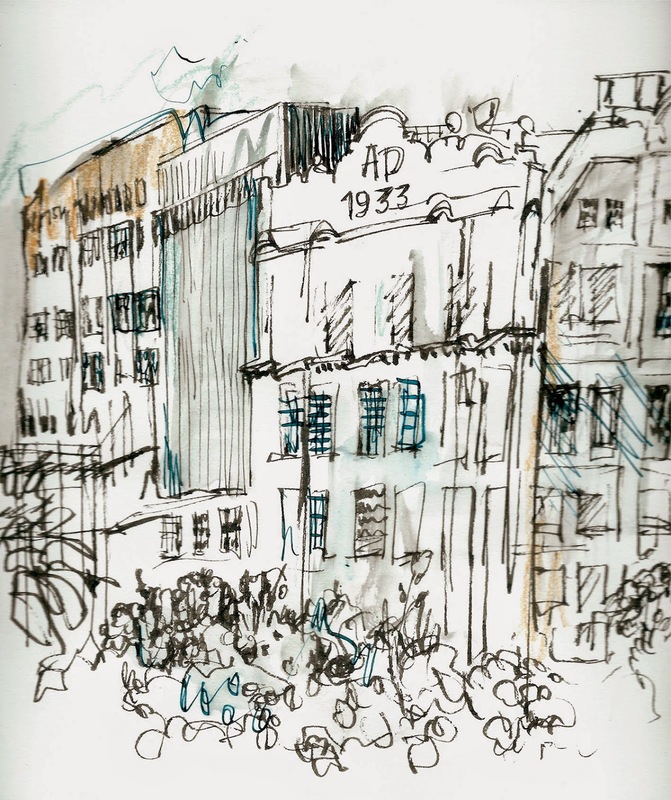 Click on map above to see a specially created map with the timings and locations of the sketchcrawl as well as other interesting locations - use the menu to click on each point to find out more information. Thanks to Katherine for doing the map. 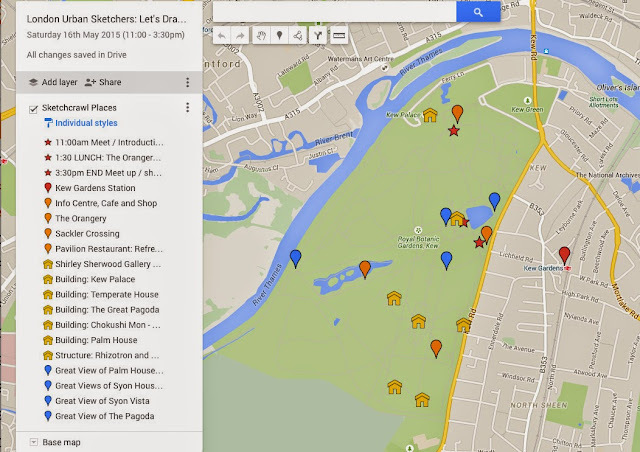 For those of you interested in sketching on the heath itself, there's also a detailed map here of points of interest. 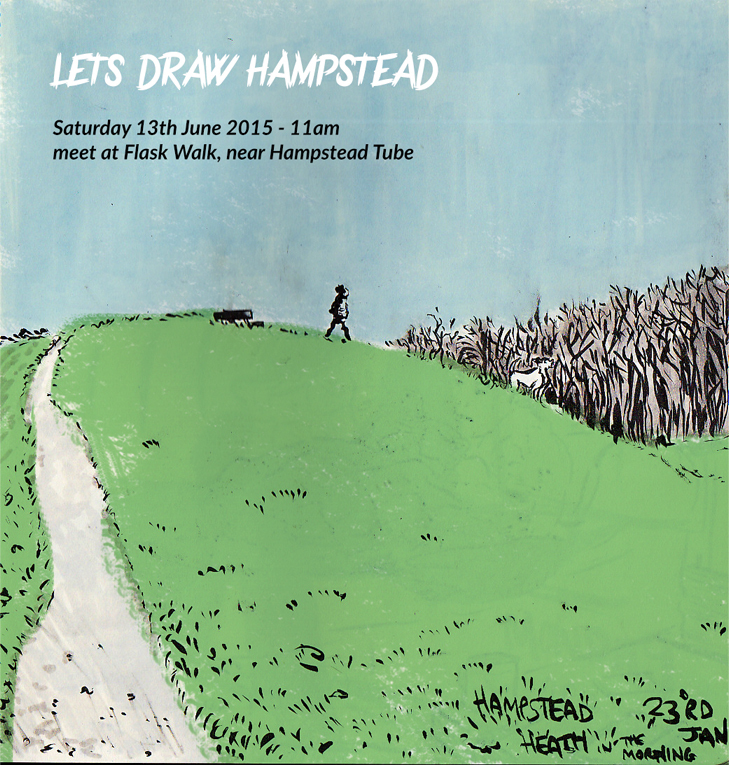 If you do want to draw on the heath, it's worth noting that it's pretty big to say the least (!) so you may not want to trek all the way back to meet at lunchtime at the museum - this is perfectly fine, we can always catch up at the end at 3.30 instead. 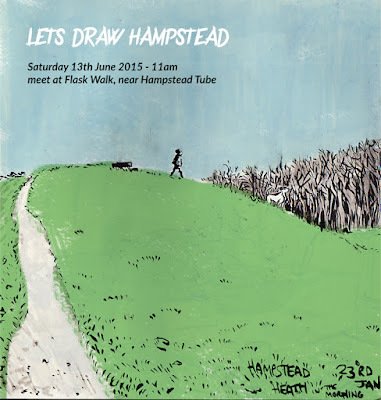 Additionally, if you don't want to do a lot of walking, it may be best to choose either Hampsead village OR Hampstead Heath rather than attempting both, but it's up to you! Hopefully June means that it's a fairly safe bet that the weather will be fine, but in England who knows! Hampstead Heath is fairly lacking in shelter, other than trees! 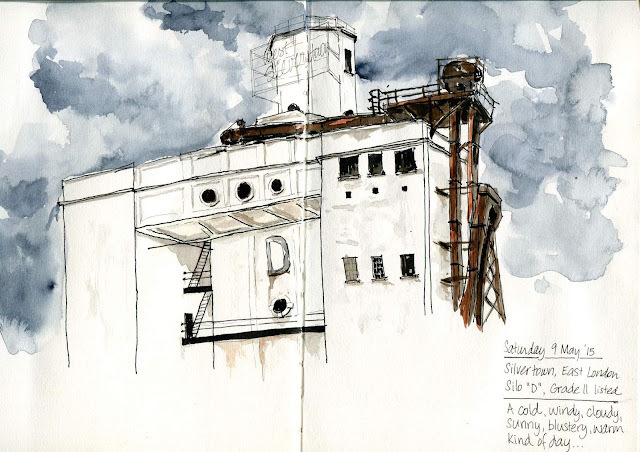 As always, it's free to join, you just need to bring your own sketching materials... and perhaps an umbrella and/or suncream. It’s not just the Chelsea Flower Show that has all the best greenery at the moment. This beautiful walled garden is a few minutes walk from the centre of Croydon in Park Hill Park and is maintained by volunteers from the local community. The ‘castle’ you can see in the background is actually a water tower built during the 19th century to serve the large increase in the town’s population. As the population expands in the 21st century too, there are more new shoots sprouting up near the station on Cherry Orchard Road in the form of new blocks of flats. Or as they always seem to be known these days - luxury apartments. 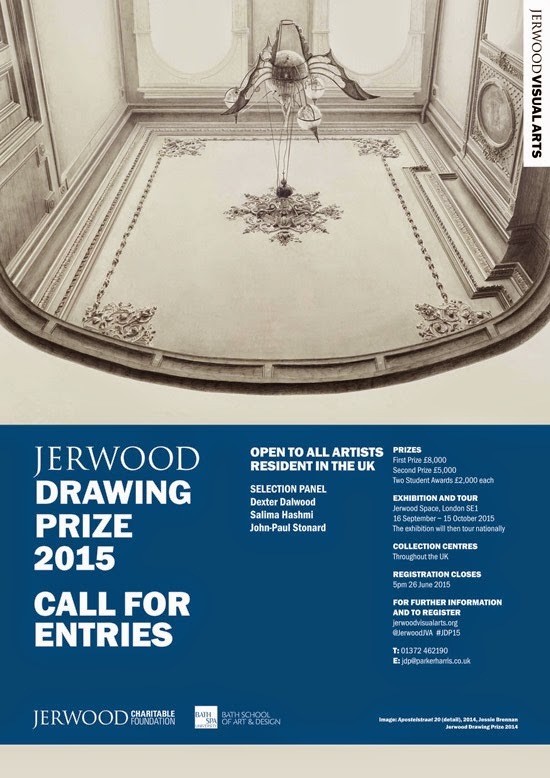 If you like drawing you may be interested in the Jerwood Drawing Prize 2015. This is the poster for their call for entries. 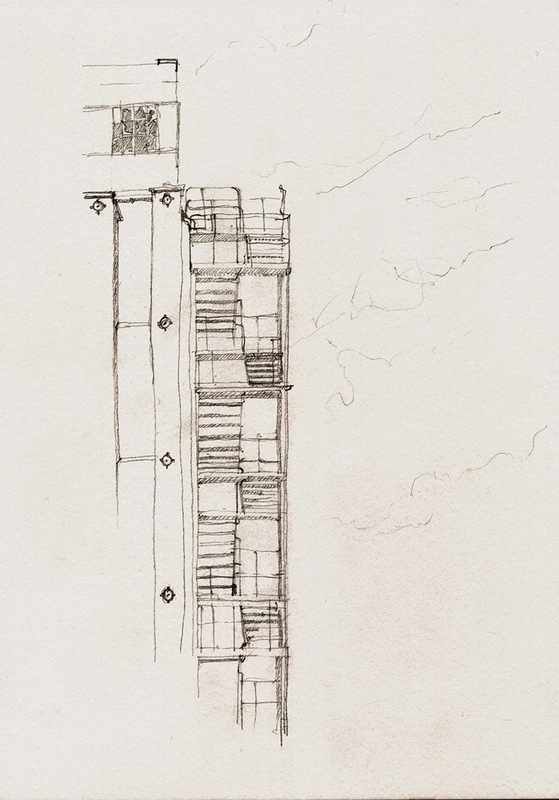 There is a First Prize of £8,000, a Second Prize of £5,000 and two Student Awards of £2,000 each. Entry is online. You can submit three entries - and fees are discounted for students. Entry is open to all artists resident in the UK. 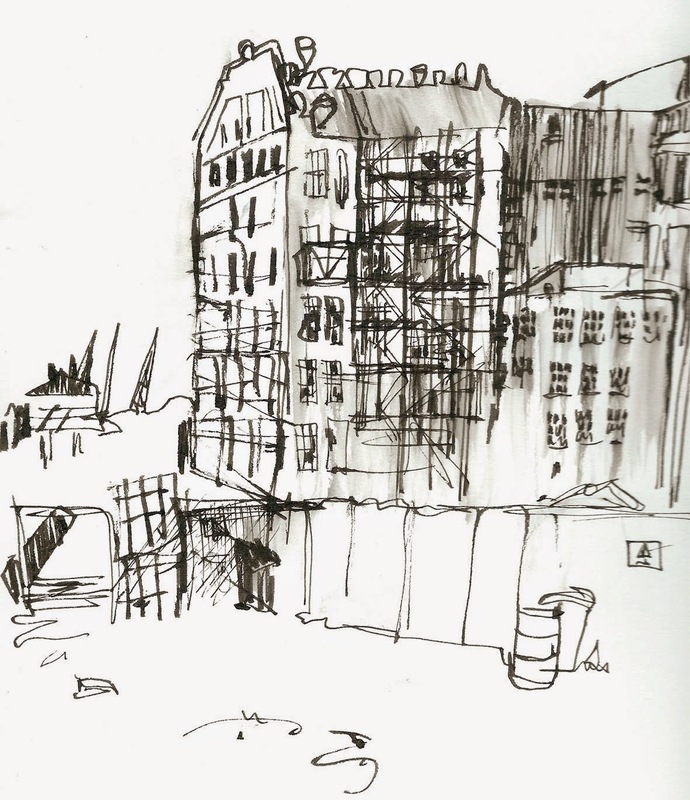 in this blog post commentary Jerwood Drawing Prize: Call for Entries by Katherine Tyrrell, one of the founders of Urban Sketchers London. She highlights how they define drawing for the purposes of this competition. A great time was had by all at the Royal Botanic Gardens at Kew on Saturday. We had blue skies and sunshine from the start and it gradually warmed up to the point where serious consideration was given to sun screen! 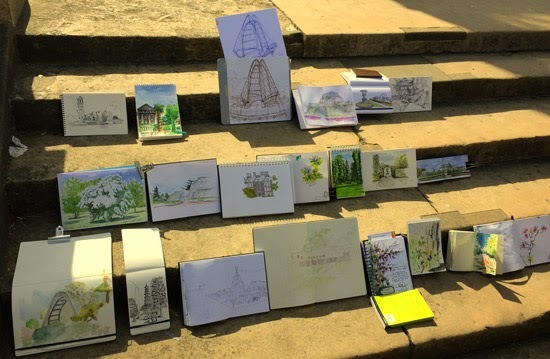 The general consensus was Kew Gardens was a really great place to sketch and very different from the normal places we go for urban sketching. The buildings are a bit different for starters plus there's a few more trees than usual! 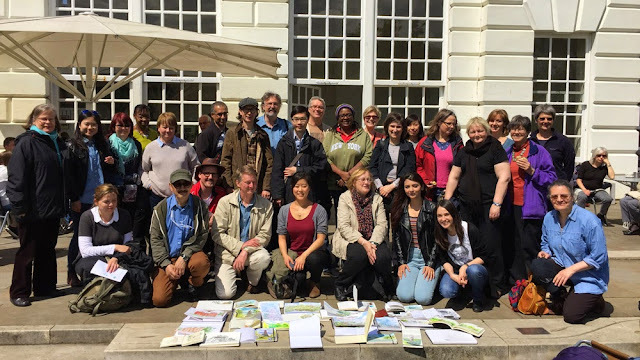 It was also fabulous to welcome people who had travelled a long distance to be at our sketchcrawl to draw Kew Gardens. We had people from Northamptonshire, Cambridge and Eastbourne - as well as a chap who hails from Iceland and a lady who got to Kew from Portland Oregon via Barcelona! 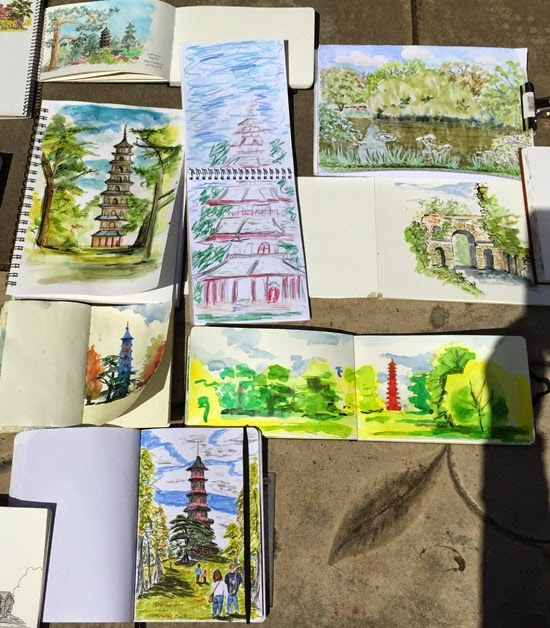 Here's some photos of the day - of sketches and sketchers - and an awful lot of Palm Houses and Pagodas! This was the group at lunchtime. Not everybody was here because it can take a long time walking from one place to another Kew Gardens! 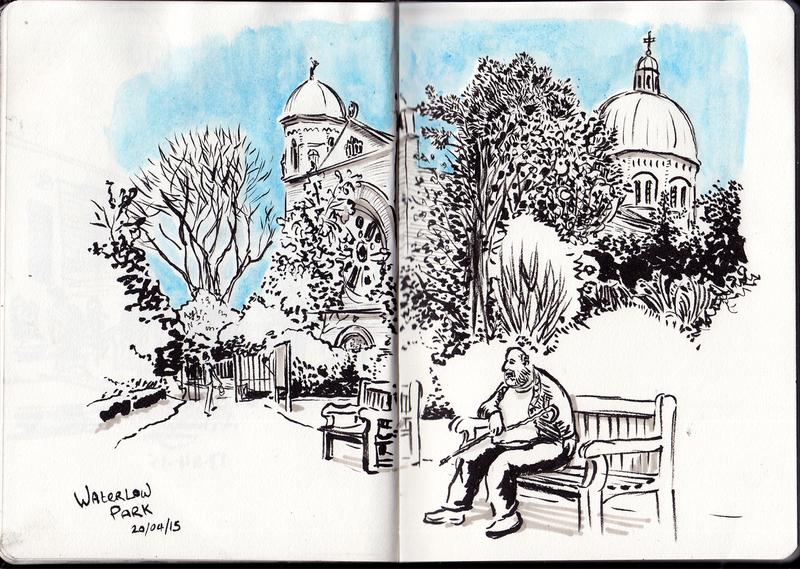 Sketches outside the Palm House at the end of the day. ....and you can see the group at the end of the day - in front of the Palm House - in the first image of this post. It was great to introduce Kew Gardens to people for whom this was the first visit - and I think Kew Gardens had some new 'Friends' by the end of the day. the Group Pool for London Urban Sketchers. 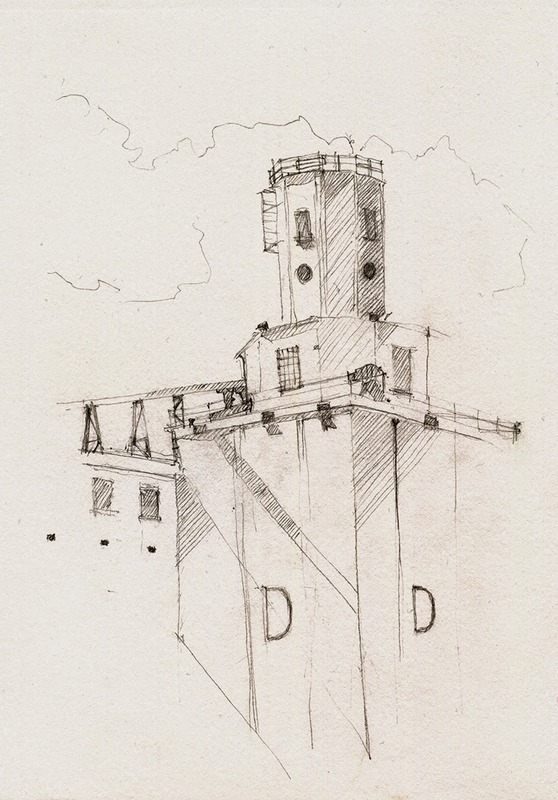 If you're not yet a member you need to upload your sketches to your own Flickr account before applying for membership. Sangeeta got retweeted by Kew Gardens! Now that's the power of Twitter! Keep an eye on the blog - this is the Sketchcrawl Page and the link to the blog post about it will be announced in the note at the top of the right hand column when the date is announced. 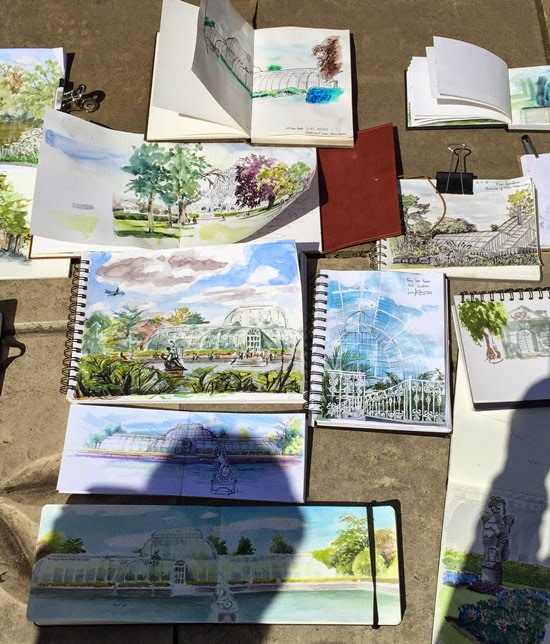 REMINDER: Let's Draw Kew Gardens tomorrow! Entrance Fee: Please make a particular note that this venue is NOT free and there is a charge of£15 per adult (£14 if purchased online) and Free if you are a Friend. Lunch: 1:30pm at The Orangery - share our sketches, group photo - and time for lunch. The Orangery has hot and cold food from Peyton & Byrne and tables and chairs to sit and eat at. You can also buy sandwiches from Tesco on the left as you walk out of Kew Station. 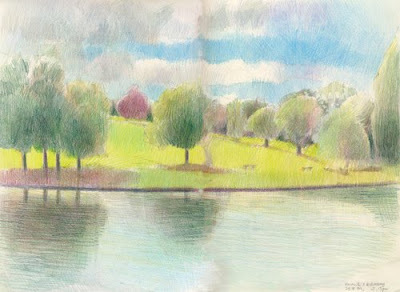 End: 3:30pm - in front of the Palm House (Lake side) - share our sketches + another group photo to add to the collection! 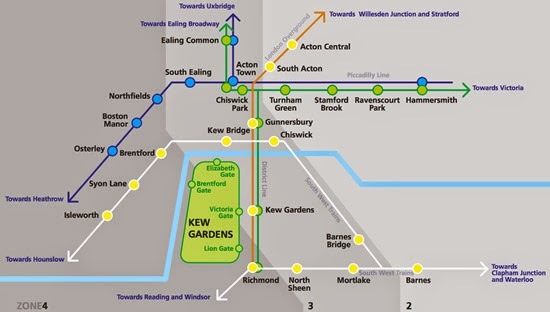 North London Line to Richmond. According to BBC Weather, the weather is due to be light cloud in the morning (15C) then sun from 3pm (17C) - so hopefully no rain. Tweet your sketches tomorrow using the hashtag #USKLondon and/or #sketching. As James said in his post below, it's hard to put your finger on the appeal of places like Millennium Mills: a vast area of broken stone and glass, weeds, graffiti, and emptiness. Perhaps because they are modern-day ruins, if that isn't an oxymoron. Like visiting Rome for example; it's startling to come upon huge sections of a city that were so obviously important and full of life at one point, now abandoned and crumbling, but with an added shock value that rather than belonging to a distant bygone age, it has occurred within our own lifetimes - the Royal Victoria Docks only finally closed in 1981. 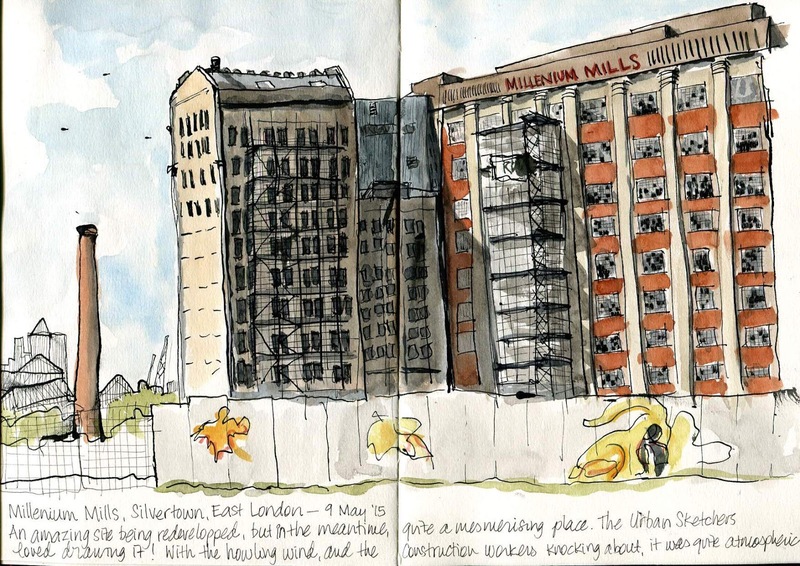 Originally built in 1905, Millennium Mills was partially destroyed first by the infamous "Silvertown Explosion" of a munitions factory in the First World War, 1917, and then again in the Second World War, by German bombing. As you can just make out in my sketch above, the building was rebuilt both times - on the left in 1954, and on the right it says 1933. 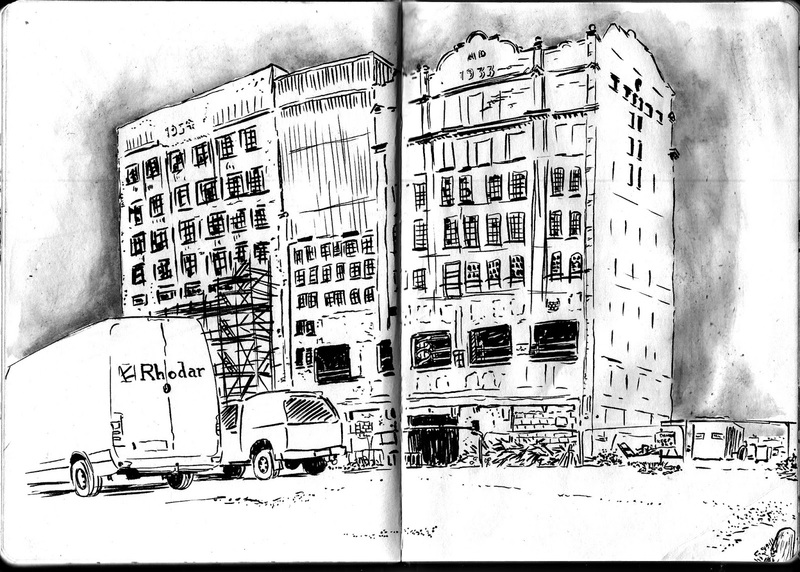 What attracted me to drawing it was that the building was now such a wreck - the company didn't really have much luck, did it? The area is not only popular with us sketchers and the location scouts for film and tv, but with "urban explorers", who are, I suppose, similar to urban sketchers but without the pencils, (and with a slightly more reckless attitude to going into places they're not supposed to go) - a quick Google reveals a wealth of photos from inside, on top of and around the Silvertown site that are well worth a look. On the far side of the site, with a stretch of water separating it from the Mill, is an intriguing and large section of open land, which from what I can gather was approximately where the munitions factory was in 1917 before it caused London's biggest ever explosion. I suppose after that they must have rebuilt something on there, but you'd be forgiven for thinking they'd just left it, as rubble and rubbish lies strewn around all over the place, and not much else, except for the odd looking "Dome". Maybe it was supposed to echo the Millennium Dome (which can be seen in the distance) but at any rate it is the most recent addition to the landscape - used as a pop-up cinema during the Olympics. 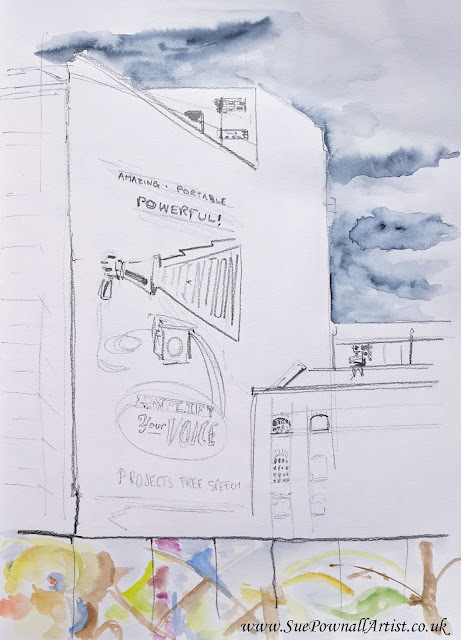 Capturing the changes at this site will be an interesting experience, and one I hope we can involve many more sketchers in over the next few years, getting different styles and perspectives as redevelopment continues. It seems to be a similar project to Kings Cross, which when I first arrived in London in 2001 struck me as a desolate, bleak, industrial shell of a place, but is now (rather successfully, I would say) completely regenerated. Seeing the redevelopment that's already occurred in the Silvertown area and the space (unusual in London) for new buildings, I'd say it's a safe bet that it will gradually become much more popular in future. 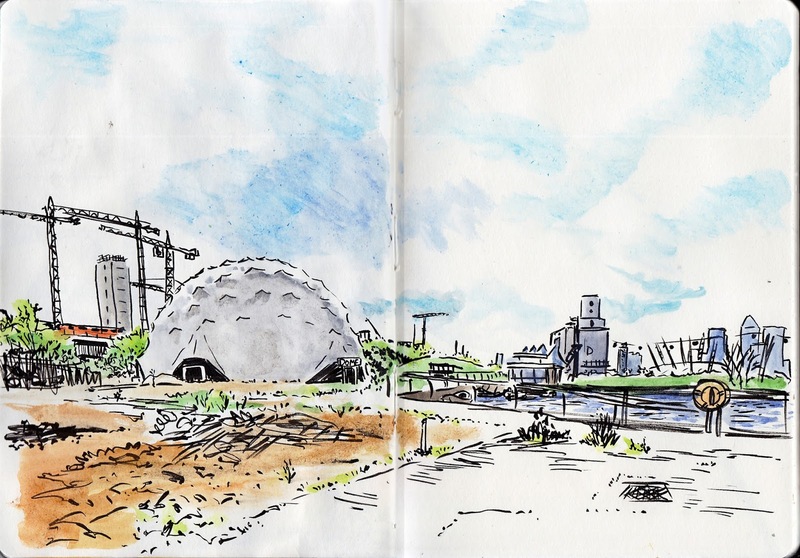 London's Urban Sketchers were recently invited to draw Silvertown, a major £3.5 billion regeneration project in east London that will turn the derelict post-industrial wasteland into what aims to be the city's "new creative capital", with 3,000 new homes and 21,000 new jobs. Named after its 19th-century founder Samuel Winkworth Silver, it handled much of the old Empire's exports and imports until the 1960s when containerisation and new docks downstream took over. 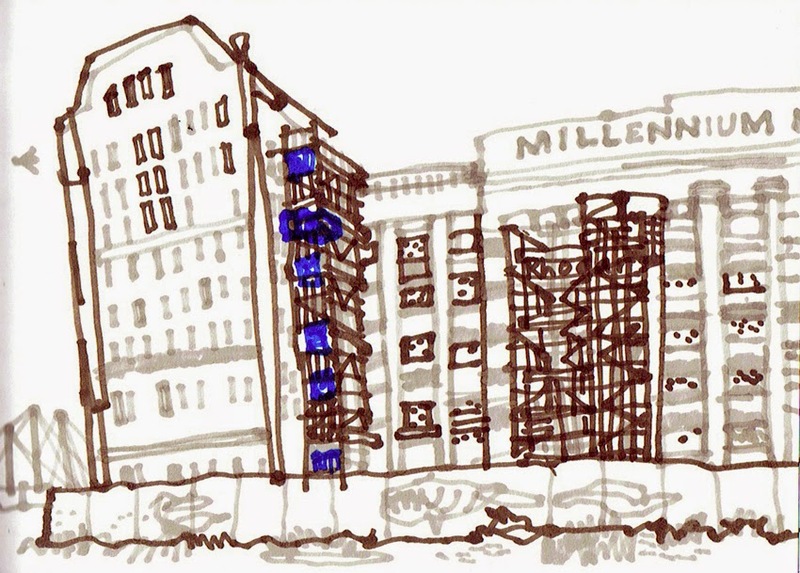 What remains - monumental, crumbling, windswept, beautiful – is Millennium Mills, once home to Rank Hovis MacDougall and Spillers, and Silo D, a surviving grain silo. Set by the Thames in a wealth of concrete, graffiti, aircraft noise and wildlife-rich greenery, the site is an exciting and evocative place to draw. Because work is underway at the 62-acre site numbers were limited to eight. 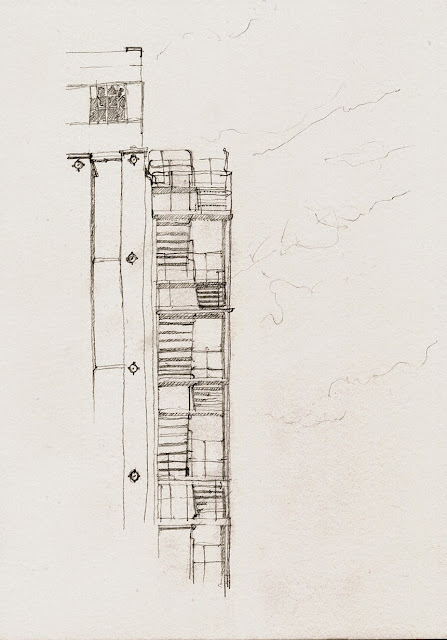 We will be returning as it develops over the years so other regular urban sketchers in London may get a chance to visit it to draw. This post includes the work of four of us from the first visit: Lis Watkins, Julie Bolus, Evelyn Rowland and me, James Hobbs. The work of the other four – Nathan Brenville, Isabelle Laliberté, Sue Pownall and Olha Pryymak – will follow in Nathan's post. The site is a forbidding place. It is reached from a high footbridge over the Thames near the Excel Centre, where planes for City Airport fly low overhead. Security is tight, and there are dogs on the site. The area inside is huge and bleak, but strangely appealing to draw. Within minutes we were scattered across the site. 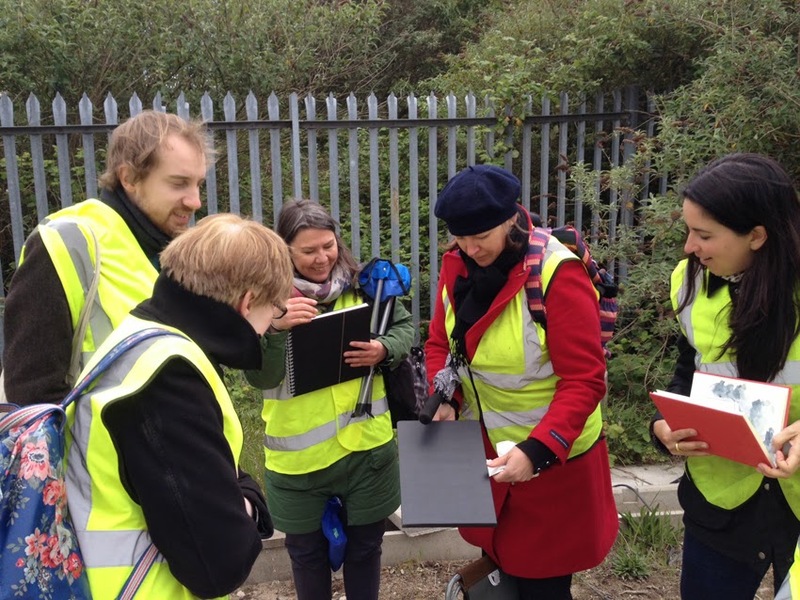 Our high visability jackets – bearing the logo of the asbestos removal specialists working in Millennium Mills – meant it was possible to pick each other out on the other side of the wilderness at what seemed miles away. What is planned for all this? 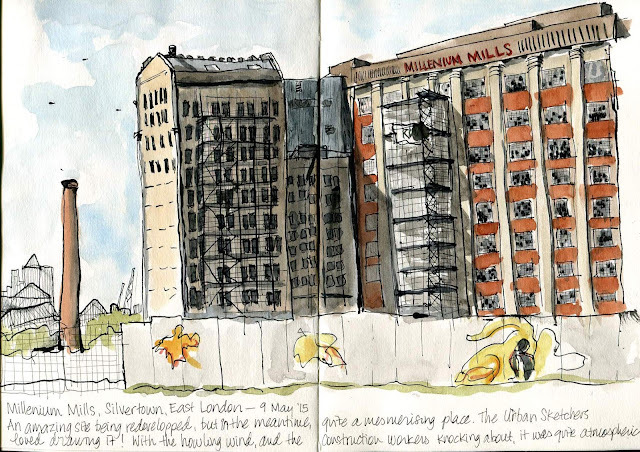 Millennium Mills and Silo D will be home to businesses and restaurants, the Crossrail link will connect it to the rest of the city and beyond, there will be new amenities for people already living there, such as schools and health services, a piazza the size of Covent Garden, new bridges and walkways... but this is all a long way off. Silvertown has been a popular backdrop for films and music videos. Yet quite why something grim in so many ways is so moving I'm struggling to understand. 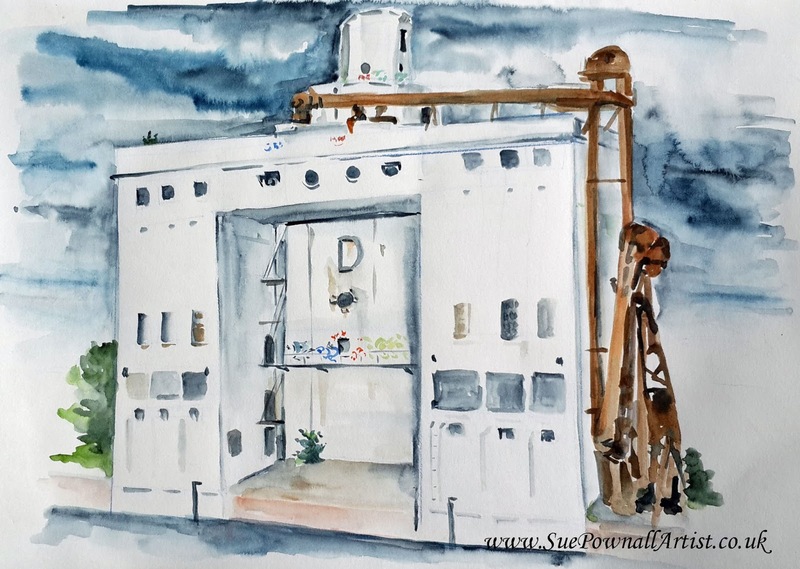 What is so alluring about urban desolation? London's sights are visible in the distance: Gherkin, Cheesegrater, Dome, Canary Wharf and the cable car. But Silvertown is still a twinkle in the developer's eye. Whatever it becomes, it can never be more lovely than it is now. 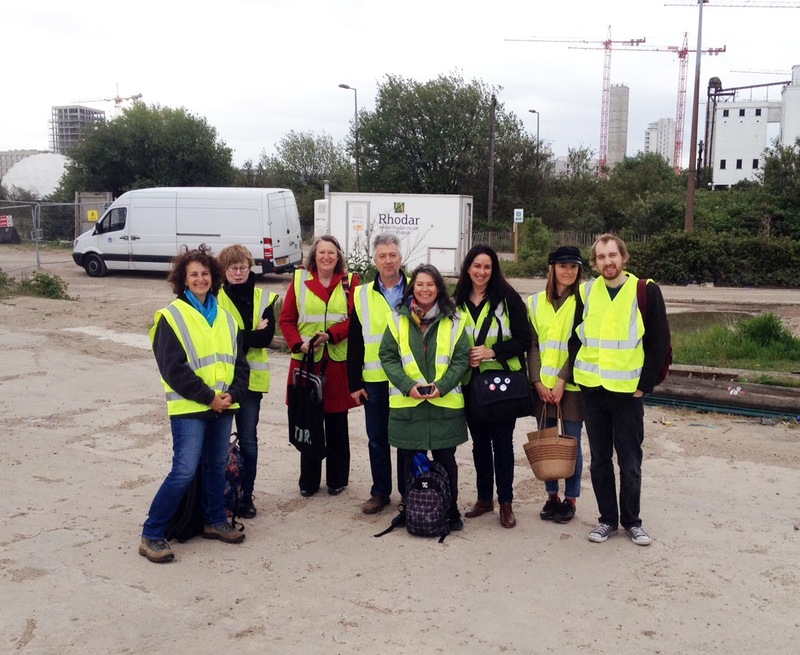 Our thanks to the Silvertown Partnership for inviting us. There are more images by the other artists on Nathan's blog, which follows this one. 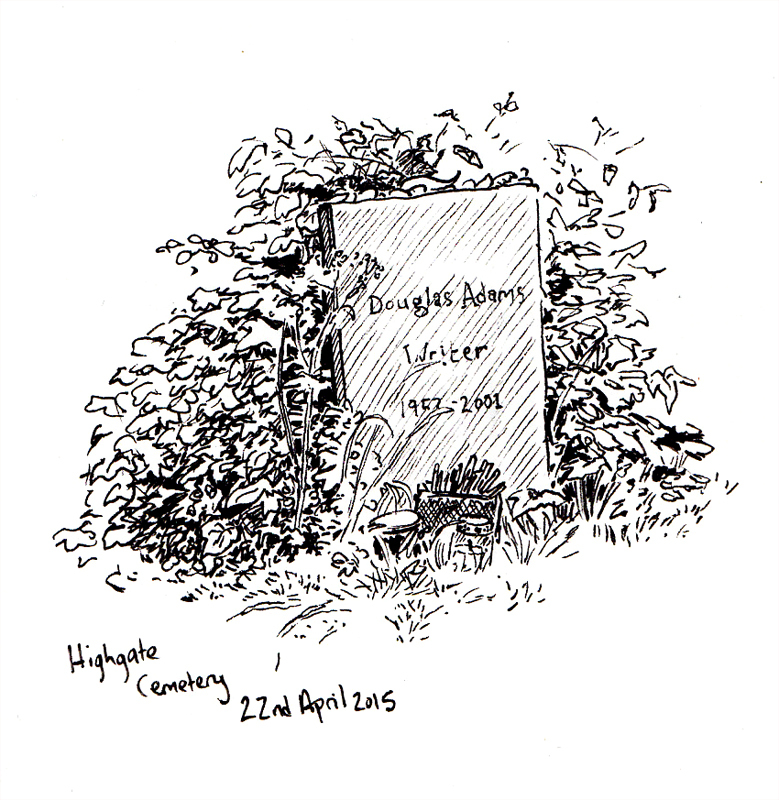 Today is apparently Karl Marx's birthday (born 1818), so I thought I would post some sketches from my recent visit to Highgate Cemetery, where he is famously interred. 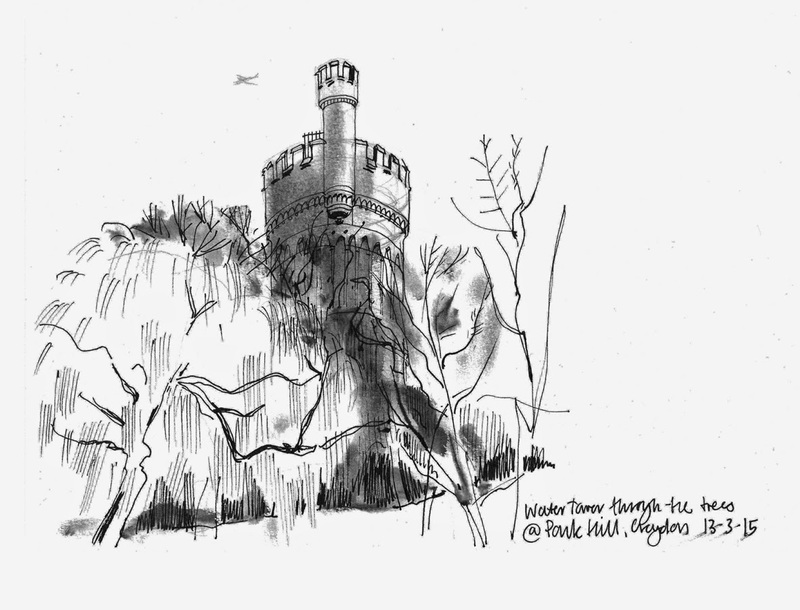 Above is his monument, normally where all the visitors flock to, although only a few came to take photos while I was sat here drawing, probably due to it being a very cold and blustery day despite the sun. He, of course, isn't buried here, but rather somewhere more discreet, further down the hill, beneath a very modest and plain headstone, beside his wife, amongst hundreds of identical headstones, as befits a man who preached equality - he in fact specifically requested that there be no monuments erected to him upon his death. As you can see, his wishes were ignored. Actually, I hadn't gone to see Marx myself, but Douglas Adams, author of "A Hitchhiker's Guide to the Galaxy" which I'd just finished reading. 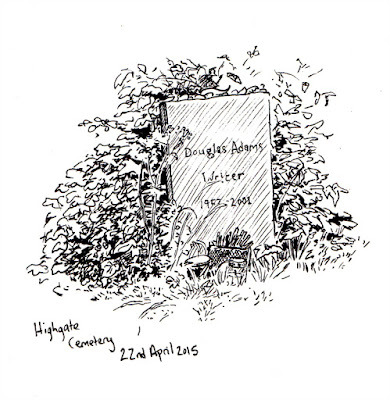 I was reading it because several months previously I'd visited Highgate Cemetery for the first time and saw his grave and thought "Ah, I have his book on my shelf at home, I must re-read it!". I'd been a big fan of his books when I was a teenager but couldn't remember much about them, so reacquainting myself with his unique and hilarious style of writing was a real pleasure. I've since moved into the Highgate area, and it's now just a short walk for me across the beautiful Waterlow Park to reach the cemetery, so upon finishing the book, I decided to pay him a return visit to thank him for his literary gifts to the world. He characteristically said nothing, of course, owing to the fact that he's dead, but I took his silence to mean that he understood my reasons for being there, that he was pleased and humbled, and that really he had a much better spot than the Karl Marx bust anyway, so he was quite alright, thank you very much. But then again, it might just've been the wind. 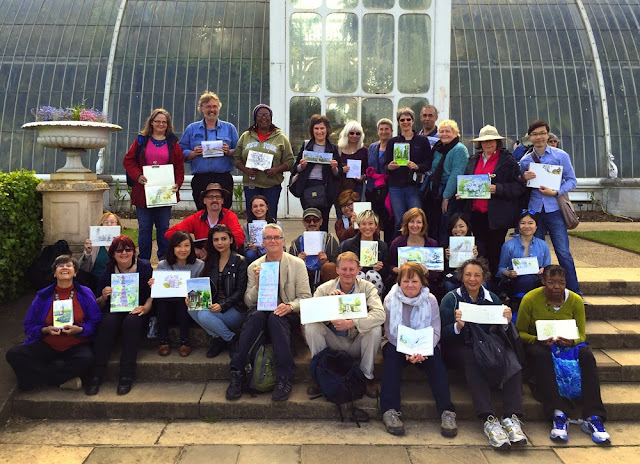 Our next London Urban Sketchers sketchcrawl will be at the Royal Botanical Gardens, Kew - in south west London - on Saturday 16th May 2015. 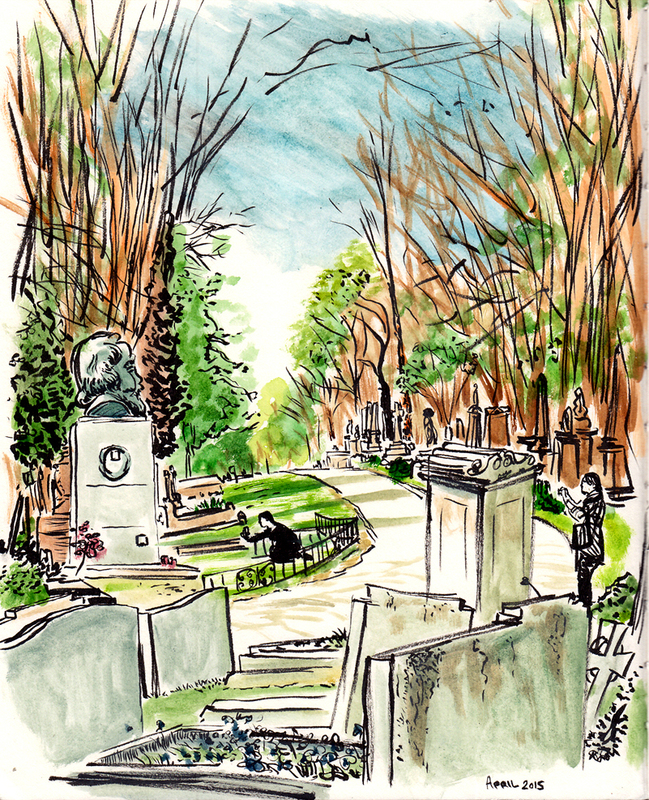 It will be my special pleasure to introduce people who have not been before to a place which has endless opportunities for sketching. It's certainly one of my absolute favourite places for a day's sketching! You'll see some of pen and ink and coloured pencils below. - overlooking Syon House on the other side of the river. ENTRANCE FEE: £15 per adult (£14 if purchased online) and Free if you are a Friend. 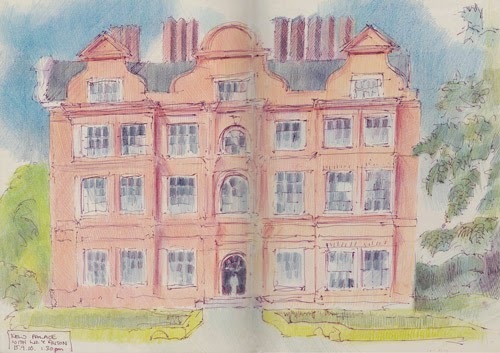 LUNCH: 1:30pm at The Orangery - share our sketches, group photo - and time for lunch. The Orangery has hot and cold food from Peyton & Byrne and tables and chairs to sit and eat at. 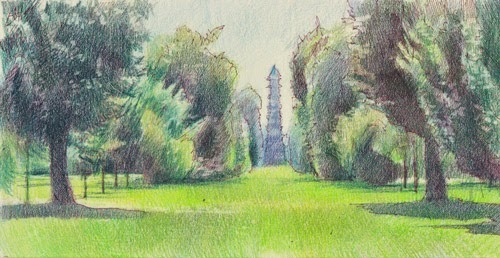 There's absolutely masses to see and sketch at Kew Gardens which is HUGE! If you've never been before, a little bit of research before you go really pays dividends at Kew Gardens. I've identified all the key features on a Google Map and annotated it for this Sketchcrawl. Just click the link to access it - and then click the icons to find out what they represent. Click the icon second from right on top line to see it full size on your screen. Use the +/- signs to get the scale right. Chokushi Mon - the Japanese Gateway - set in a formal Japanese Garden. Not visited as much as some other parts of the garden and usually very peaceful. This was originally done on mat board cut to postcard size and was posted to a lady who lives in the USA! Pagoda Vista - very probably one of those views which says "This is Kew". 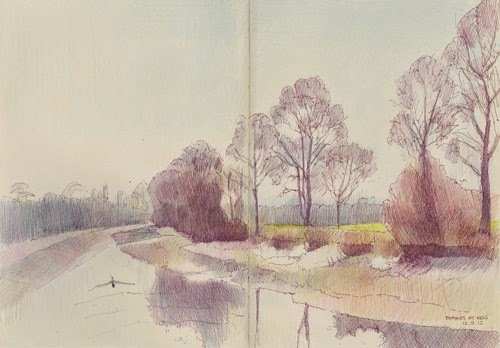 Syon Overlook - looking down the River Thames towards Richmond and across the Thames to Syon House. 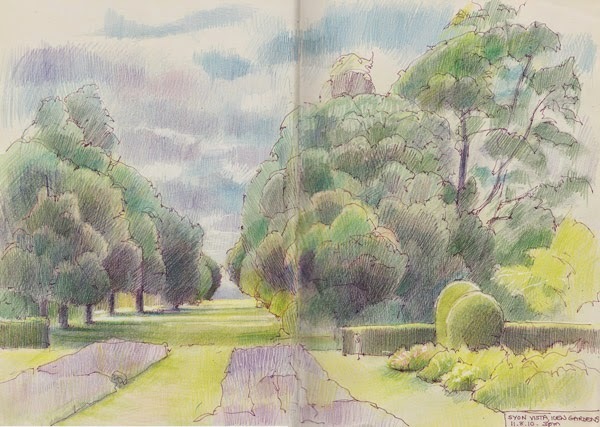 People who are wondering about how to sketch the big old trees at Kew may get some inspiration from the Exhibition: Kew's Heritage Trees by Masumi Yamanaka at the Shirley Sherwood Gallery of Botanical Art (see map).